For all you fans of my ‘Chicken Vicious’, here is the Polynesian counterpart. Sweet, tangy, easy, spicy, and absolutely the best Polynesian chicken dish you ever tasted! For all you pressure cooker fans, this is a snap. This will work in a regular Dutch oven, but the cook time will be about 3 times as long. Be sure to add red pepper flakes in stages to achieve desired heat. I use 1 to 3 tablespoons! 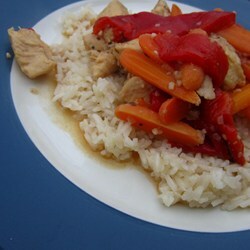 Place onions, green bell peppers, and carrots in the pressure cooker; add chicken. Whisk 1 cup orange juice, whiskey, brown sugar, vinegar, red pepper flakes, ginger, and sesame oil together in a bowl; pour over chicken mixture. Stir to combine. Place lid on pressure cooker and lock; bring to full pressure over medium heat until chicken is no longer pink in the center, 15 minutes. Release pressure according to manufacturer’s instructions. Keep chicken mixture warm. While chicken is cooking, combine water and rice in a microwave-safe casserole dish. Cook on high in microwave until water is absorbed and rice is tender, 15 to 20 minutes. Stir butter into rice; toss well. Whisk 1/2 cup orange juice and cornstarch together in a bowl; stir into hot chicken mixture until whiskey sauce is thickened. Serve chicken over the hot buttered rice.